Jigsaw puzzles just like you used to do at the kitchen table, without ever having to worry about losing a piece! 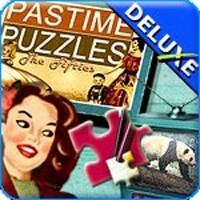 Play this fun 50's themed game as you try and solve 50 puzzles in two modes: Classic and Express. Select a puzzle from the collection, set a difficulty level and attempt a Puzzle Challenge, or take your time to finish the Big One! When you have completed enough puzzles, discover new variations and surprises in the Puzzle Collection! It's good times for one and all!